iDid: Your Digital Avatar : iDid Inc.
iDid is an intelligent application that proactively helps you as you go about your day. Intelligent Home Automation: Supports Belkin WeMo, Insteon, Nest and Wink systems to control thermostats, switches, outlets, dimmers, light bulbs and garage door openers, Works with several WiFi, Z-wave and Zigbee compatible products such as Lowe’s Iris, Phillips, GE, Leviton, Lutron and GoControl. Alexa Interface: See “Talking to iDid using Alexa“. Automatic Life Logger: Detects and logs places, drives, miles, flights, calls and sleep. Logs them as calendar events into your private calendar that you choose. 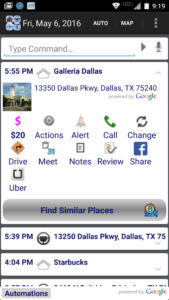 Easily call, navigate to, set up a meeting, get Uber, create alerts, set up automations and share places. Voice Commands: “remind me to call home when I get to work”, “remind Alice to get milk at Kroger”, “turn family room light on when I get home after dark”, “set downstairs thermostat to 72 degrees when Rita is at home”, “buy batteries”. Automated Traffic and Hazard Alerts: Predicts destinations, scans for traffic and alerts you. Alerts you if places are closed. Automate Phone Settings: Such as silencing phone in movie theaters, turning Bluetooth on when driving and off otherwise, turn WiFi on only at home and work, etc. Smart Location Sharing: Share current trip, Share forever, Share till we meet, Share for an hour. Proximity alerts for friends and places. 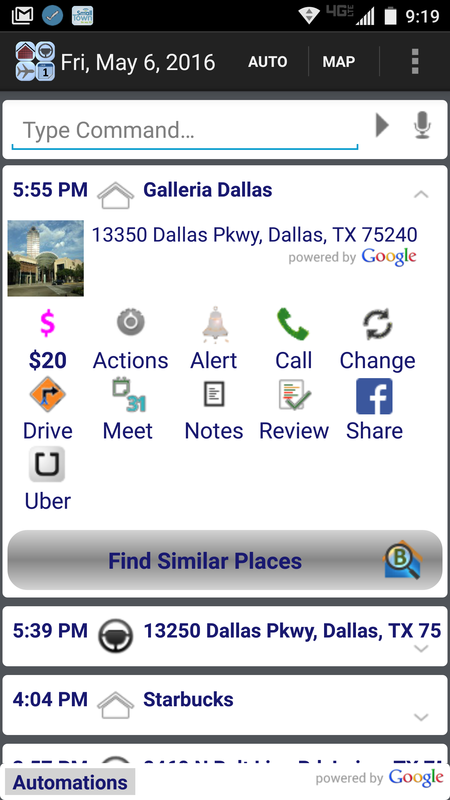 Similar Places: At any place – with one click – scan for similar places nearby so you have options. Logging Your Places:As you go about your day, iDid learns of the places you visit and logs them for you. No manual data entry is needed. For example, if you had dinner at “Outback Steakhouse”, iDid will log that event with place name, place address, phone numbers, website information, time you arrived and how long you stayed. Logging Your Drives: iDid automatically detects when you are driving and captures your start point, start time, destination, arrival time, how long you drove and miles driven. Logging Your Flights: Without any trip or ticket information, iDid learns of your flights and logs them for you. This is perfect for capturing actual flight times and use the auto-actions functions to take actions such as emailing your spouse automatically when the flight lands. Flight logging is under beta test. Logging Your Calls: iDid adds location information to all calls. So you know where you were when you made or received a call. In addition to location information, iDid captures all typical call information such as parties involved, duration etc. With this you can agglomerate both time spent physically visiting a client and time spent calling a client. Logging Your Sleep: Several transit professions require their drivers to have a good record of their sleep for safety reasons. Use iDid and it creates an automatic record for you. To use the automatic life logging feature, just download and install, open the app, select a calendar and that’s all! iDid runs as a service on your phone and will automatically detect your drives, visited places, flights, sleep and will log everything into your private calendar including your calls with location information for each call. To browse your logged events, check your calendar or use the “Activities” view in the app itself. Note that you can slide pages to get to events from past several days. To generate a report of events for several days or weeks use the “Create Report” function. When you are at a place with stores right next to each other, at times they are coded with the exact same location. When iDid runs into this situation, it picks a business based on your patterns. If the business selected is not the place you visited, you can easily change that. Just click on ‘Change’. iDid gives you other businesses in the immediate location. Just select the one you were at and iDid changes it. Once done iDid remembers your choice in the future. If this is a place you visit often, you can also define this as a personal place. To learn how to do that see this post. The Similar Places link will bring up other places like the place you have visited or are visiting. For example if you are at the “Home Depot”, it will show you other hardware stores, general contractor stores, nurseries, paint supply stores and so on. Check out the Plan-B app by iDid Inc as well which is a separate app that provides this function. As iDid keeps track of your activities, any media you create – such as pictures you take is automatically tagged with your current activity. If for instance, you are a contractor who visits several properties a day and like to keep updated pictures of your work or send them to your clients, this function is ideal. You do not have to file your pictures in separate folders per property or in any other way deal with their management. Just take the pictures. That’s all. To recall pictures you have taken (or any media that you have created for that matter), pull up that event either in Today’s Events or Maps and you’ll see a link to “Media“. Click on that link and it pulls up your pictures associated with that event. Select the ones you want to send, view or share and use the corresponding menu option. iDid allows you to share using all of the methods you have on your phone: text, email, Facebook, Twitter – whatever you like or need. This is a great way for professionals who needs to track expense receipts as well, just take a picture and it’s automatically associated with the place you are in.